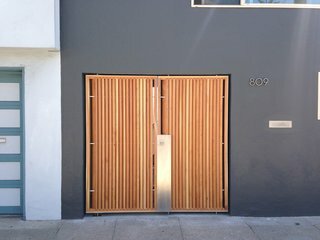 The front door of a home is a critical design element that sets the tone for the rest of the building. Visible from both the exterior and interior, it is frequently a site of drama, color, and special detailing. 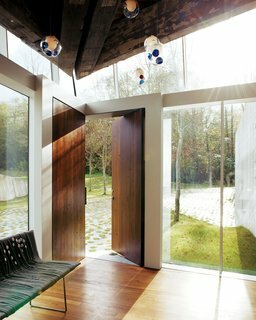 Here, we’ve rounded up some unique and eye-catching front doors that will have you wanting to step inside and see more. Lightweight, shuttered doors made of western red cedar line the outer edge of the front porch, providing privacy and protection from the weather. The wood is left unstained, so it will age naturally, similar to the surrounding ipe wood. Just behind the shutter system, 50 feet of glass walls—broken into four sets of sliding panels—open to eliminate the barriers between indoor and outdoor spaces. 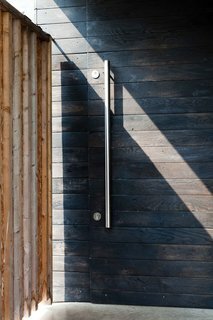 The front door of this house in Scotland is built from charred cedar boards—a traditional way of fireproofing wood developed in Japan. In this case, the effect on the front door is likely more aesthetic than preventative, though you can never be too careful. The owner of this Prague apartment splits his time between Japan and the Czech Republic, and these two design influences are reflected in the detailing. 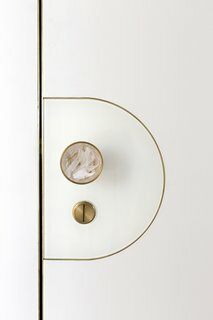 Klára Šumová, who designed the furniture and fittings, and Michaela Tomišková of Dechem, who designed the glass items and lighting, worked with A1 Architects to create brass fixtures, chandeliers, and doorknobs and handles with glass infills crafted by skilled Czech glassblowers. 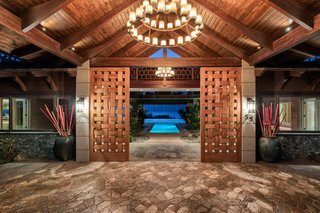 Designed by architect Robert Robinson after a Balinese resort, this Hawaiian estate commands sweeping ocean and multi-island views. The pool is visible, even from the custom front doors, which give off a warm, local vibe through their woven appearance and wood construction. 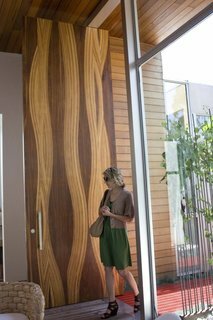 The front door is an awe-inspiring, 14-foot, mixed wood creation made by L.A. custom door fabricators Real Door Inc. 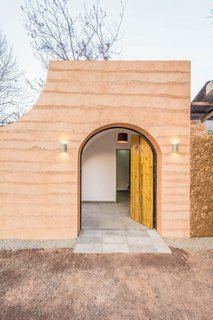 The wood used in making the door were mostly leftovers from the shop, says Dino of Real Door Inc. A gentle wave pattern accentuates the material's natural grain. A metal-and-glass door with a modern-but-industrial edge ties into the home's material palette of pre-weathered corrugated steel cladding, buff limestone walls, and large aluminum apertures, along with an interior palette of cedar-clad ceilings, oil-rubbed steel, and exposed concrete floors. The porte cochère is the main entry to the house. A mahogany-and-glass pivot door allows you to see through the Great Room to the back porch and the valley beyond. 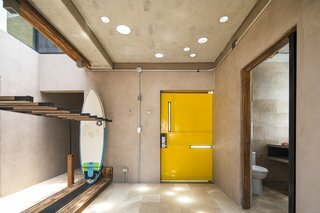 The bright yellow door adds a playful touch to a concrete abode. There is ample storage for surf gear throughout the dwelling, creating a connection between inside and out. Conceived as a glass wall or window that could swing open rather than a typical door, the resulting glass-and-metal piece is so heavy that it required its own foundation! Thanks to clever engineering by Sand Studios, even seven-year-old Macy can operate the 2,000-pound door. 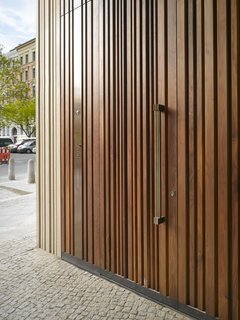 The Museum for Architectural Drawing in Berlin, designed by Russian firm SPEECH Tchoban & Kuznetsov, has a wooden door that mimics the structure's textured concrete exterior. 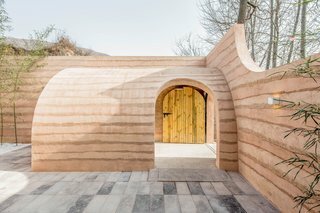 In the renovation of a traditional cave home in Weinan, China, the arched front entrance mimics the curve of the caves, and the wooden front door with contrasting black hinges swings open in two parts. 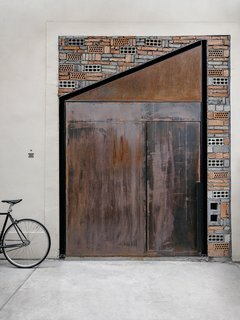 Reclaimed bricks and a pivoting, weathered steel door speak to the industrial flavor and salvaged materials found throughout this office renovation by architecture studio Linehouse. The result is a design that is both dramatic in form and texture, but subtle in its natural palette. 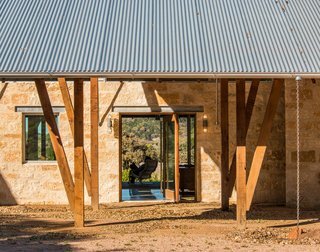 The focal point of the home’s modernized exterior is a custom, wood-and-steel entry gate designed by atelier KS and built by DeFauw Design + Fabrication, a local fabricator who also made custom closing hardware for the piece. Franz and Paré-Mayer paired angled cypress slats with an industrial metal frame to create the entryway. 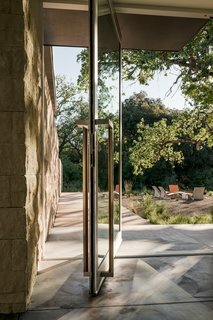 A few paces behind the gate, a large glass door provides direct access to the home, fulfilling the owners’ wish for an entry vestibule that would be separate from the street. 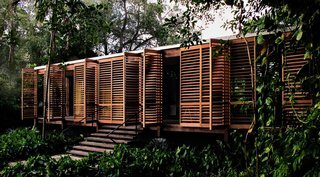 The angled wood slats offer privacy from the exterior, while selectively allowing light to penetrate through.